Download "The Medicare Access and CHIP Reauthorization Act of 2015 (MACRA) Summary of SGR Repeal and Replacement Provisions"
1 ACOG Government Affairs May 2015 The Medicare Access and CHIP Reauthorization Act of 2015 (MACRA) Summary of SGR Repeal and Replacement Provisions This landmark bipartisan legislation, signed into law on April 16, 2015, repeals the fundamentally flawed Sustainable Growth Rate (SGR), ending years of payment uncertainty and retroactively undoing a 21.2% payment cut which went into effect on April 1, Passage of MACRA is the result of two years of ongoing collaboration between Members of Congress in both the House and Senate, in close consultation with outside healthcare stakeholders, including ACOG and the entire House of Medicine. For over 15 years the SGR s effect made it nearly impossible for physician practices to invest in health information technology and other patient safety advances, even plan for the next year, or to continue accepting Medicare patients. It impacted the approximately 30,000 ob-gyns who participate in Medicare. Medicare payment policies have also been used by many private health insurers and TriCare, the insurance program for military members and their families. Over 600 national and state medical societies and specialty organizations, plus patient and provider organizations, policy think tanks, and advocacy groups across the political spectrum supported the bill. ACOG, through its SGR Task Force, closely reviewed and commented on the bill s myriad of drafts, winning inclusion of several important provisions and improvements. (Link to ACOG letters/comments). 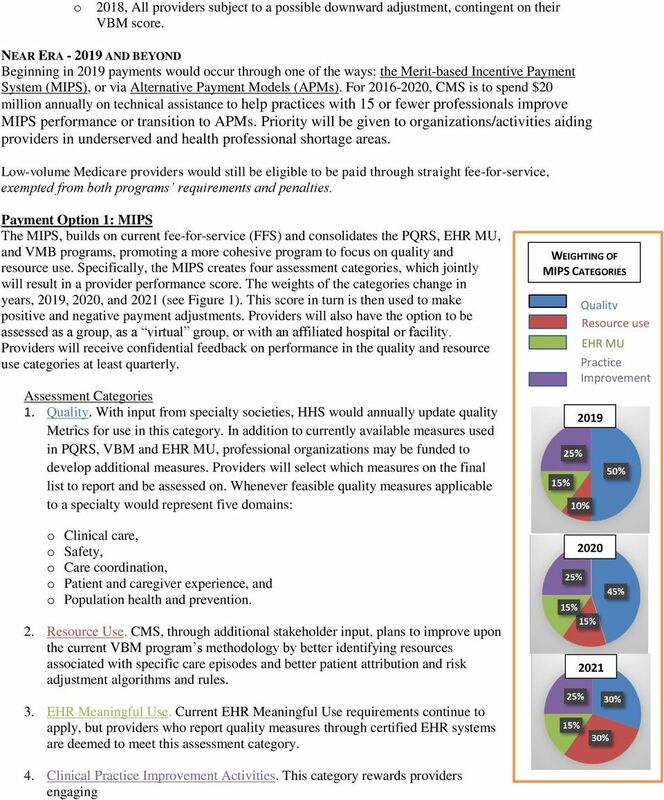 The new law stabilizes base payment rates, streamlines current pay-for-performance/quality measure reporting programs, and will allow physicians to be reimbursed by Medicare, under 2 main tracks, with the goal of promoting accountability for high quality care, as defined by the respective specialties. ACOG plans to work closely with the Department of Health and Human Services (HHS) and its Centers for Medicare and Medicaid Services (CMS) through the regulatory process to ensure that the law s provisions are appropriately implemented. The law s focus on delivery of quality care will require specialty societies to provide active and rigorous input so this reformed payment system will appropriately compensate physicians, while ensuring access to top level care for Medicare beneficiaries. 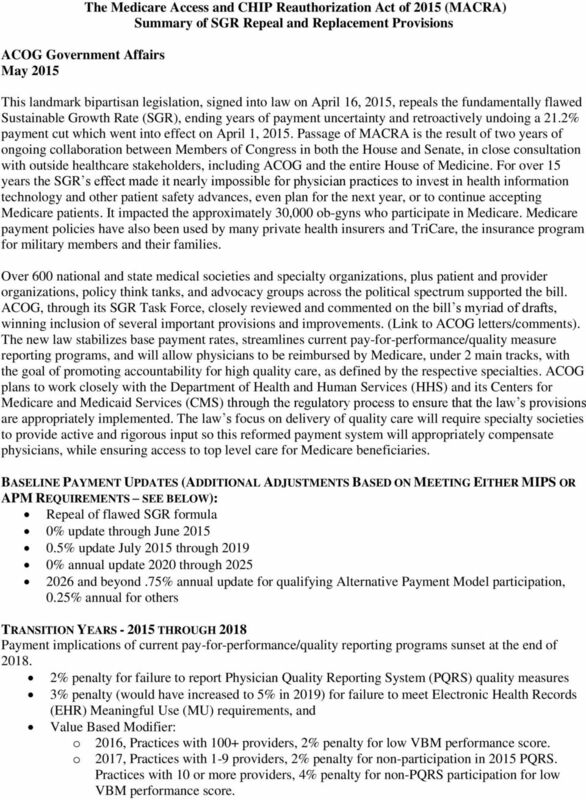 BASELINE PAYMENT UPDATES (ADDITIONAL ADJUSTMENTS BASED ON MEETING EITHER MIPS OR APM REQUIREMENTS SEE BELOW): Repeal of flawed SGR formula 0% update through June % update July 2015 through % annual update 2020 through and beyond.75% annual update for qualifying Alternative Payment Model participation, 0. annual for others TRANSITION YEARS THROUGH 2018 Payment implications of current pay-for-performance/quality reporting programs sunset at the end of % penalty for failure to report Physician Quality Reporting System (PQRS) quality measures 3% penalty (would have increased to 5% in 2019) for failure to meet Electronic Health Records (EHR) Meaningful Use (MU) requirements, and Value Based Modifier: o o 2016, Practices with 100+ providers, 2% penalty for low VBM performance score. 2017, Practices with 1-9 providers, 2% penalty for non-participation in 2015 PQRS. Practices with 10 or more providers, 4% penalty for non-pqrs participation for low VBM performance score. 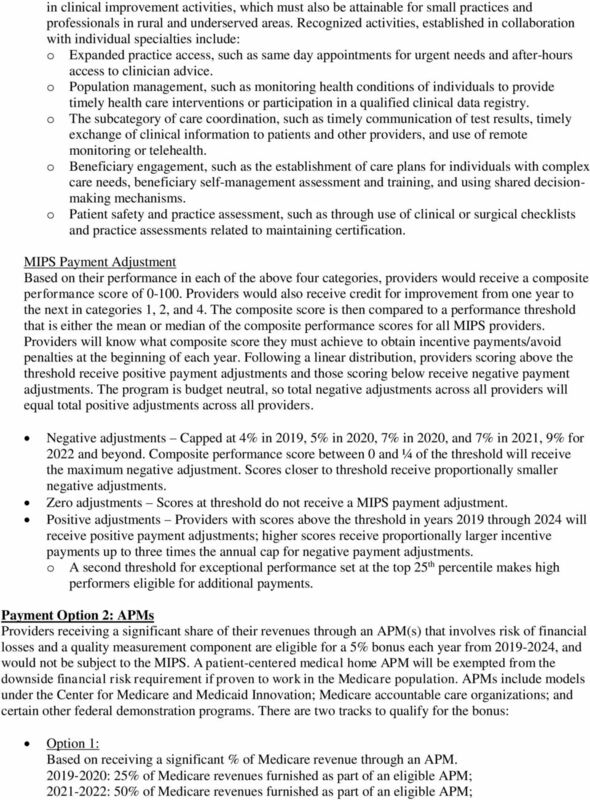 4 2023 and beyond: 75% of Medicare revenues furnished as part of an eligible APM. Option 2: Based on receiving a significant % of APM revenue combined from Medicare and other payers (excluding payments from Veterans Affairs and the Department of Defense). If no Medicaid APM is available in a state, a professional s Medicaid revenue will not be counted against the proportion of revenue in an APM. 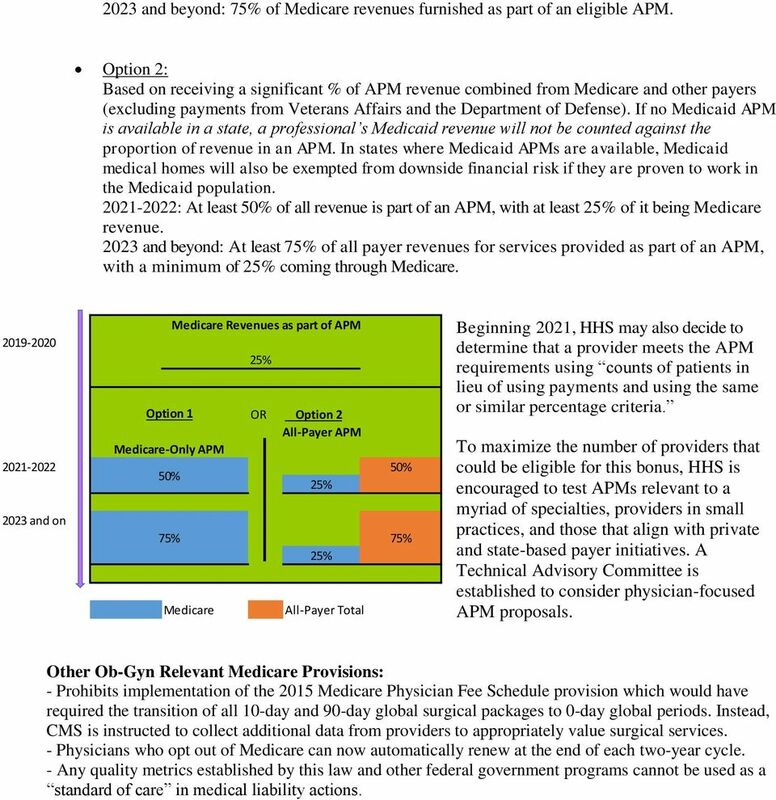 In states where Medicaid APMs are available, Medicaid medical homes will also be exempted from downside financial risk if they are proven to work in the Medicaid population : At least 50% of all revenue is part of an APM, with at least of it being Medicare revenue and beyond: At least 75% of all payer revenues for services provided as part of an APM, with a minimum of coming through Medicare Option 1 OR Option 2 All-Payer APM Medicare-Only APM % 50% 2023 and on 75% Medicare Revenues as part of APM Medicare All-Payer Total 75% Beginning 2021, HHS may also decide to determine that a provider meets the APM requirements using counts of patients in lieu of using payments and using the same or similar percentage criteria. 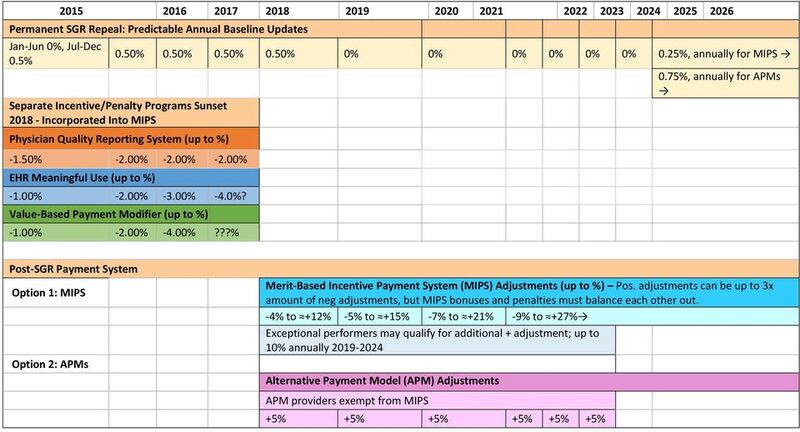 To maximize the number of providers that could be eligible for this bonus, HHS is encouraged to test APMs relevant to a myriad of specialties, providers in small practices, and those that align with private and state-based payer initiatives. A Technical Advisory Committee is established to consider physician-focused APM proposals. Other Ob-Gyn Relevant Medicare Provisions: - Prohibits implementation of the 2015 Medicare Physician Fee Schedule provision which would have required the transition of all 10-day and 90-day global surgical packages to 0-day global periods. Instead, CMS is instructed to collect additional data from providers to appropriately value surgical services. - Physicians who opt out of Medicare can now automatically renew at the end of each two-year cycle. - Any quality metrics established by this law and other federal government programs cannot be used as a standard of care in medical liability actions. HFMA Region 9 Webinar Are You on the Right Path to Value? The Honorable David Durenberger Former U.S. Senator from Minnesota. Evan Falchuk Vice Chairman, Best Doctors, Inc.
9/10/2015. Learning Objectives. Current State - Quality Measures. Playing the Quality Metrics Reporting Game. How are they measured?